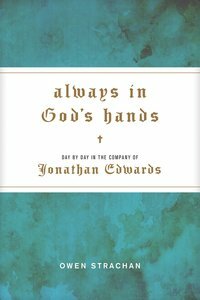 :This year, get to know the true Jonathan Edwards-and see the hand of God in your own life like never before. Jonathan Edwards is one of the most respected early American theologians. In Always in God's Hands, Owen Strachan recovers the real Jonathan Edwards-the thinker, the compassionate father, the courageous reformer-as opposed to the caricature of him that is often presented. Edwards believed God was ever-present in each of our lives, caring and encouraging us in every moment. In a moving letter to his daughter, he reminds her of that comforting truth by describing her as "always in God's hands." Through daily quotes from Edwards's letters and sermons, this inspirational devotional reveals the soaring theology and comforting spirituality of one of history's most faithful and gifted pastors. With each meditation, compiler Owen Strachan offers refreshing and relevant insights, encouraging you in your walk with God. About "Always in God's Hands: Day By Day in the Company of Jonathan Edwards"
Owen Strachan is the Managing Director of the Carl F. H. Henry Center for Theological Understanding at Trinity Evangelical Divinity School. Strachan is a PhD student in Historical Theology at TEDS. He has worked for the Commissioner of the Maine Department of Labor, 9Marks Ministries, the White House, the US Department of State and the presidents of Bowdoin College and Southern Seminary. Strachan was a history major at Bowdoin College and completed an MDiv in biblical and theological studies at Southern Seminary. He was a teaching assistant for the SBTS president and a research assistant for professors of history, literature, and theology. With Doulas Sweeney, Strachan is writing five books for Moody Press on the life and thought of Jonathan Edwards (The Essential Edwards Collection, out in early winter 2010).